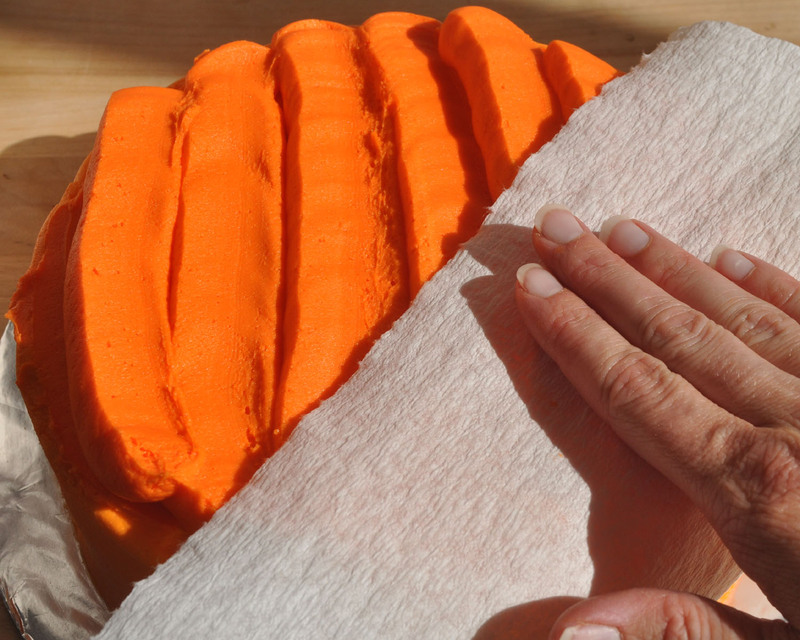 You'll want to ice your cake smooth with orange frosting before you start decorating. To give the pumpkin its ridges, I loaded up a plastic bag with icing. Cut a 1-inch section off of the corner. Pipe your "stripes" by squeezing the bag pretty hard and moving slowly. The harder you squeeze and slower you move, the fatter your stripes will be. I recommend holding the bag straight up from the surface of the cake. 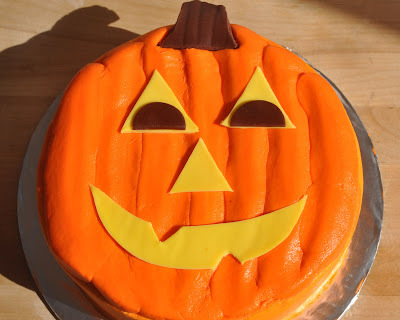 The nice thing is that if you mess up-- which I did at least 4 times-- you can scrape it off... just be careful not to get too close to the cake and end up with crumbs... and try again. 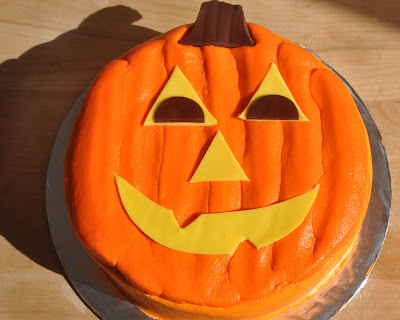 Because you are covering the whole top of the cake. You'll never know!! You want to end up with many stripes, kind of like this. 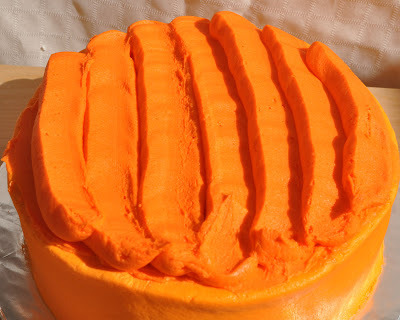 If you've used a "crusting" icing like my decorator's buttercream icing, you can smooth it out a little bit so that it looks a little less bumpy. Just give it about 10 minutes to sit, then use a Viva paper towel, like you see in the photo above. 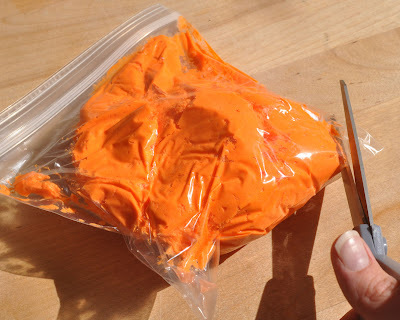 Now, you can try to do this with store-bought icing, by placing it in the refrigerator for about 30 minutes or more -- uncovered. 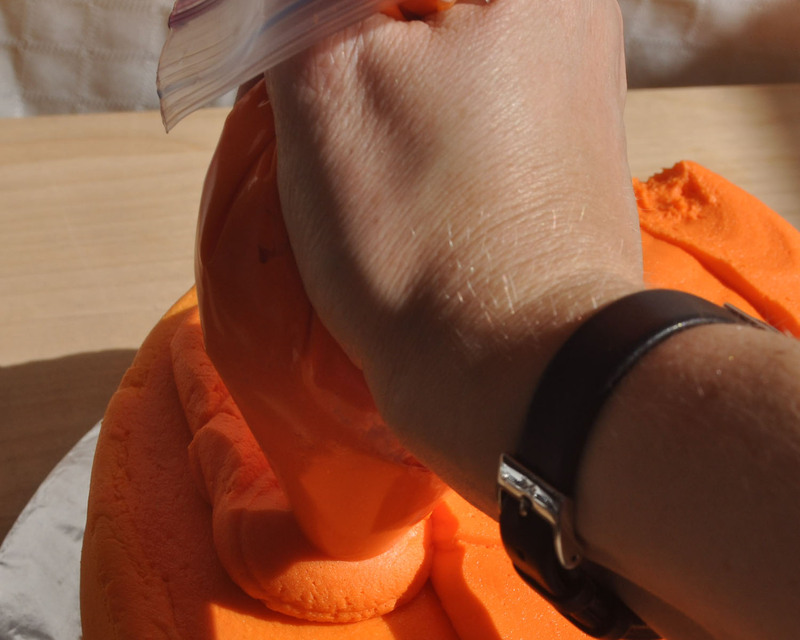 But test a small area first before just jumping in and smooshing the whole top. I've had some that harden enough to make it work... and some that don't. To decorate the jack-o-lantern cake, you can either use fondant or tootsie rolls. 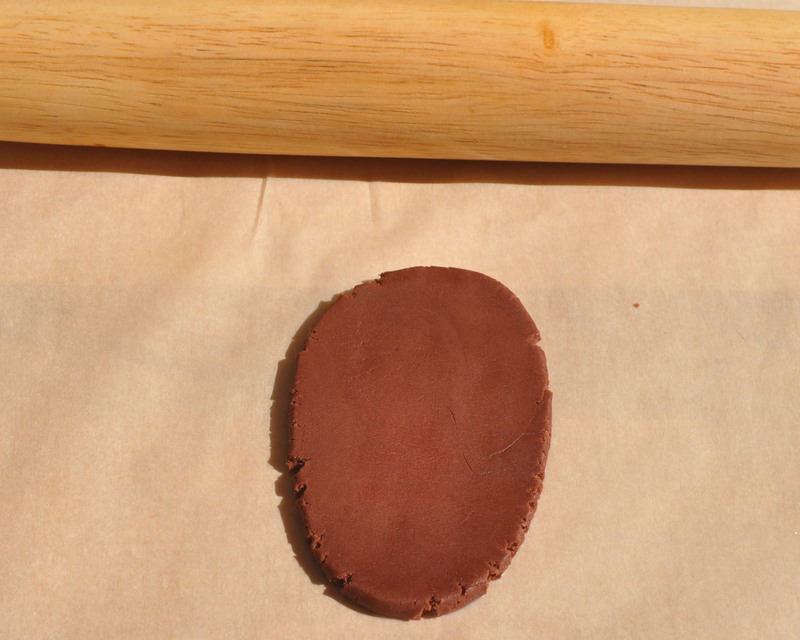 If you're using fondant, color some brown, and some yellow. You only need maybe 1/4 cup of each. 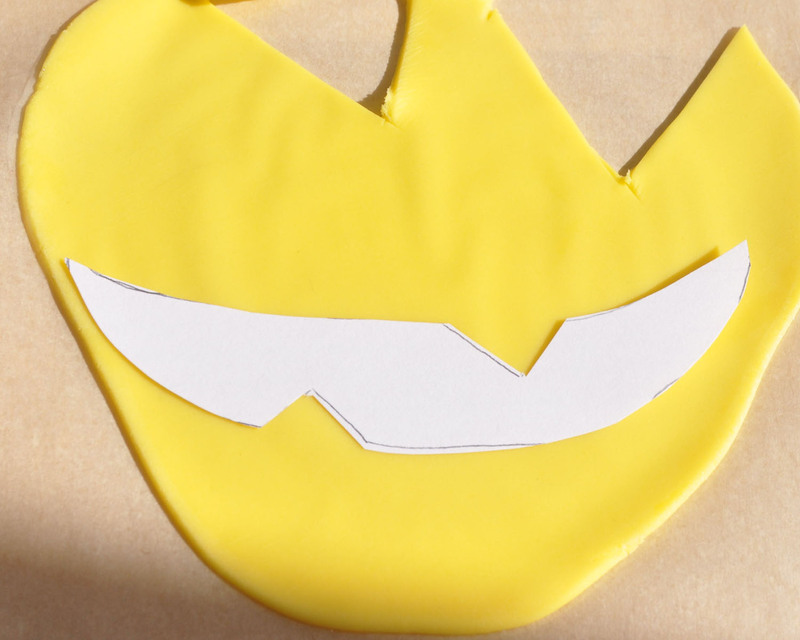 If you're using Tootsie Rolls, get them soft by kneading them in your fingers, and combine maybe 10-20 of each regular Tootsie Rolls, and the yellow lemon-flavored ones. 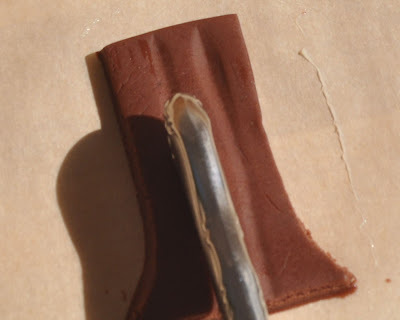 You will need to roll out the fondant or candy on a piece of parchment paper greased with shortening. Aim for a thickness of about 1/4-1/8"-- about the thickness of a quarter to a nickel. Then, just use a knife to cut out a stem shape. 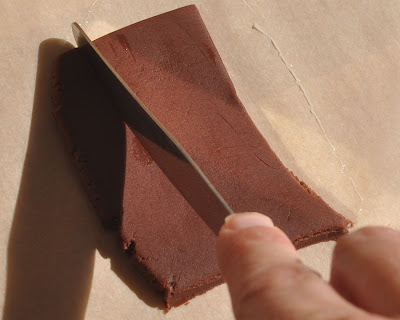 And use the back of the knife to make indentations like the stripes in the stem. To make the eyes, nose and mouth, I used two note cards as templates, and cut those in the shapes I wanted before placing them over the yellow fondant to cut them. I used a biscuit cutter and the brown fondant to cut out the little "eyeballs." 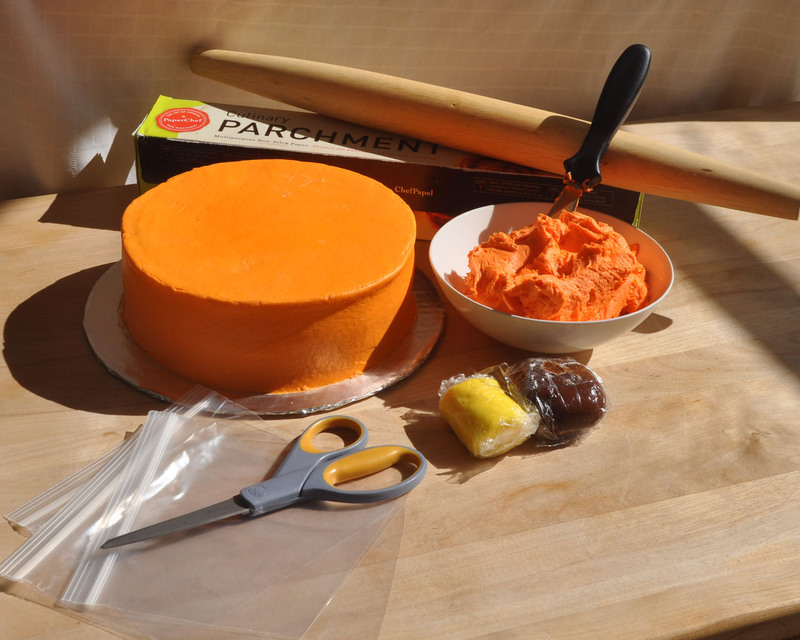 Then, you just have to arrange the pieces of fondant on the cake, and enjoy!